Could apes, like humans, soon be swiping right to choose their mates? Scientists at the Apenhuel Primate Park in Apeldoorn, the Netherlands, hope to increase the chances of successful breeding by using a tablet to show Samboja, the zoo’s 11-year-old female orangutan, pictures of available males from an international breeding program, according to the Guardian. It’s part of a four-year study — dubbed “Tinder for orangutans” — that aims to gain insight into how primates make their mating choices, Thomas Bionda, a behavioral biologist at the zoo, told Dutch broadcaster NOS. While the orangutans won’t actually swipe left or right, researchers will observe how Samboja responds to the images on the tablet screen. If she gives more attention to one male over another, the zoo can narrow down which breeding partner she will meet in real life. Bionda said the zoo, which is located about 60 miles east of Amsterdam, hopes to increase the likelihood of a “click” between the potential mates, as apes sometimes have to travel from different continents just for an encounter. The biggest obstacle of the orangutan study so far has been building a tablet strong enough to withstand some wild handling. When researchers gave a tablet that was reinforced with a metal frame to two of the zoo’s older orangutans, they responded well and tapped the screen, van Berlo told the paper. But Samboja managed to smash the screen between her fingers. Once the tablet is orangutan-proof, the experiment will examine whether sight alone is enough to make a primate match. 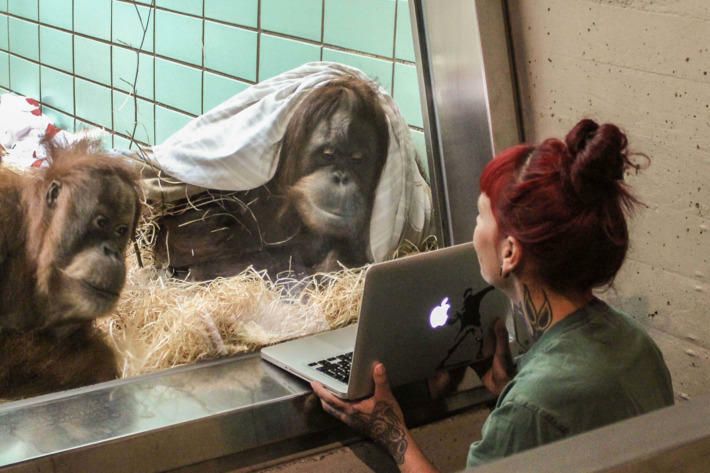 A comparable “video dating” study with orangutans was completed last year at the Wilhelma Zoo in Stuttgart, Germany, in which two females were shown video clips of potential mates on a MacBook through a window. One of the apes, Sinta, showed interest in a male from a Belgian zoo. The primate pair was set up on a “date” in Belgium, but the meeting did not produce any offspring, according to a statement from Wilhelma Zoo. Still, the zoo hopes the experiment will eventually improve the birthrate for the endangered species.